Based on that description, it sounds like being versatile is a good idea, and anyone who has read Patrice’s blog knows that she is an enormously talented and versatile writer. No mystery there. Her narratives are not only superbly written, heartfelt, and passionate, but they also reveal the character of her personal humanity, which is loving and generous and compassionate. Anyone who is NOT affected by her writing is simply not paying attention. The person who is “Patrice the Writer,” is courageous and bold and articulate and astonishingly refreshing in her unique approach–one that I aspire to emulate. “Patrice the Person,” is someone that I admire greatly and I am especially glad to share the planet with her. Patrice has been generous in her characterization of my blog as being worthy of the attention of others, and I am grateful for her support and encouragement, but I actually think she simply enjoys tormenting me, as her brothers did to her growing up. Thankfully her approach to the task does not include spit, but even without the inclusion of spit in her method, I too have developed a deep and abiding fondness for her. 2. I lived in Germany for two years in the late 1970’s. 4. Camping in the forests and mountains is my favorite vacation choice. 5. When I was in high school, I fell thirty feet off of a painter’s scaffold to the wooden floor in the gymnasium while hanging decorations for a dance. 7. When I was in college I met and conversed with Truman Capote. These blogs all have something to offer beyond the average…Enjoy! http://gideonjagged671.wordpress.com/ – Gideon Jagged is a novelist, essayist and all-round smart guy. http://jonelfernando.com/ – living a full life isn’t about having possessions, it’s about gaining and maintaining human connections. http://jaggedwriter.wordpress.com/ – Striving every day to make her dreams come true, and never forgetting the dreams that got her there in the first place. http://futuristicallyyours.com/ – a group of 26 of the brightest futures, ranging in ages from 18-29, write REVERSE self-letters, as in their future-self (their age advanced 20-30 years) writes them, their present-self reads them. http://yellowvoices.wordpress.com/ – a woman with a passion for art currently working at the bottom of the food chain in the fashion industry. http://fasterthanlight.me/ – Gaming, media, technology, and philosophy. She has a lot to offer the world; we have to keep insisting on it (nicely). Patrice does have a lot to offer the world, but I think the right approach is support and encouragement, rather than insisting (even nicely), since the joy of writing comes from freely giving of ourselves for the sake of the words. Writing worth reading is the kind of writing Patrice produces without any insistence from her readers! Thanks so much for your support, both you two. I don’t want to haggle over word choice, but I “insist” you both follow your hearts. Peace to all those who fill our own with feeble ones with courage. Love this list, John. I can’t imagine falling from such a height, that’s one of my fears. Hope you didn’t break too many bones….Truman Capote!!!! He is an unbelievable writer, was it odd to be in the same room talking to him? In Cold Blood is one of my favorite books. It actually was a bit of an odd feeling to be standing next to someone so famous that I admired so much. One of my all time favorite books is “Breakfast at Tiffany’s,” by Capote, but unfortunately I only had a book ABOUT Capote with me at the time called, “The Worlds of Truman Capote,” by William L. Nance which he signed for me. He was very generous in his praise of the book and seemed surprised that someone had it since it had just come out in paperback that year (1973). He was very much shorter than me and spoke very slowly, almost hypnotically to me as a young college man. I told him how much I loved “Breakfast at Tiffany’s,” which is about the life of an aspiring writer in NYC, and he recommended that I stay in school for as long as possible, and not to rush out into the world until I was better prepared. They had given him an honorary degree that day, (Temple University) so I suppose he was obligated to encourage us to stay in school. I have some pictures somewhere, so maybe I will try to dig them up and write a blog post about the experience. It was fun trying to figure out random things to say, and I enjoyed your list as well….John H.
Congrats and thank you, in that order then twice again. 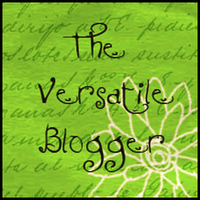 It’s easy to see that you are definitely versatile…and your blog deserves notice. Keep pushing the envelope…sooner or later something will break….John H.
My! Thanks you for your vote! I really am new to this and since my first post, family have meant I’m away from my computer and resorting to borrowed time on friends machines. I’m not sure I have read 15 other bloggers yet but your list seems a great place to begin when I’m properly online again! Peace & Love for Christmas and the New Year, I look forward to reading your recomendations and further post. I owe you a lot, dear John. Thank you once more. I wouldn’t describe anything you have written as silly, though, and all of us who read your writing benefit from your perspective, regardless of our reading level. As an avid reader myself, I immediately recognized your writing as lively and honest, emotional at times, and yet striking right at the heart of the matter. You may not recognize yourself as I do, but it is very difficult to be objective about our own talents, whatever they are. Your writing muscles are quite healthy and supple, and I can’t wait to see what you come up with from here. Your courage in acknowledging your as-yet-unfulfilled dreams, and in sharing what you have learned along the way, with all of your ups and downs, is something that I admire greatly. The honor is mine. Please continue to pursue your dreams, to share your thoughts and feelings, and allow us to benefit from your unique perspective. You don’t owe me anything, but I would be very glad to be a fellow writer, along for the ride beside you here…..John H.